This apartment is a great choice if you are looking for a smart flat with a pool, by the beach, short walk to shops, restaurants and bars and with easy access to the airport (20 minutes in a taxi). The apartment is bright and airy, well-maintained with comfortable furniture and beds (one double bed, two single beds), well-equipped kitchen and TV with UK channels BBC, ITV, Sky Sports, UK Gold. While the complex is centrally located, it is far enough away from the vibrant nightlife to remain quiet at night. It is popular with couples and families with young children. There is a small supermarket and bar/cafe on site. The apartment is spread over two floors with kitchen and open plan dining and living space downstairs with double doors to the balcony which has a table and four chairs. Balcony is pleasantly shady for most of the year. Sun hits the balcony from 11am to 2pm during the summer months (from April to September). It's a great spot for lunch or evening drinks with its view of the pool below you and Mount Teide up and ahead of you. The complex has free wi-fi; the balcony is the perfect place to check your emails, post your photos on social media and keep in touch with the folks back home. The kitchen is small with a hob, fridge with freezer compartment, microwave, kettle, toaster, toasted sandwich-maker, saucepans, frying pan, plates, glasses, mugs, cutlery and kitchen utensils. It has everything you need to make a light supper and eat in. The dining table has four sturdy wooden chairs. Living room has two comfortable sofas, TV with UK channels (BBC, ITV, Channel 4, Sky Sports, UK Gold and kids channels too) and a bookcase full of light holiday reading. Look in the cupboard under the stairs for beach kit and the ironing board. Upstairs you'll find the main bedroom with a double bed and lots of storage space. Off the main bedroom is a small, half-sized room with two single beds and sloping ceilings. It is suitable for one adult or two children aged 3-12 years. It is too small for two adults or two teenagers. To reach the bathroom, the occupant of the small bedroom must cross the large bedroom. The bathroom has a bath with a shower over it, bidet, toilet and basin with mirror. The bathroom is also off the main bedroom. Tiled floors throughout to keep you cool in the hot sunny weather. The complex has one large pool (heated in Winter) and a paddling pool with gentle slide for the under-5s. You can use the pool for swimming (free) or you can rent sun loungers to sit by the pool, with drinks and ice creams readily available from the poolside cafe. The cafe does pretty good breakfasts and lunches too. Gardens around the complex are extremely well tended with exotic flowers and tropical plants. The pool and entire pool area has been re-tiled and landscaped for summer 2018. Iron and ironing board in cupboard under the stairs. You can hang wet towels and swimming things on the drying rack on the balcony. All bed linen and bath towels are provided. There is a hairdryer. Parque Santiago 1 is a quiet complex, largely occupied by British people who have retired in Tenerife and appreciate an early night. A security guard patrols the complex at night to ensure that it remains calm and restful. It is not the ideal place for partying 20somethings. If you are lucky enough to be 20something, you will find a much better party elsewhere in the resort. I hope you have a great time on your holiday! Don't forget that you can email or phone me during your stay with queries or problems or to report things that are not quite right. It is important to me that you enjoy your stay – don’t suffer in silence and wait until you get home to report a problem. Playa de las Americas is a smart, fashionable beach resort with manicured gardens and parks, low traffic volumes and the world's best brands jostling for your attention in the shopping malls. Parque Santiago sits right on the beach front, in a quiet spot. You are in the middle of it all but away from the noisy bars and crowds. Everything you need is within a few minutes walk: supermarket, beach, restaurants, shopping. Need some quiet time? You can sit on the shady balcony and check your emails using the free wi-fi or soak up the sun by the pool. The pool is one of the few in Tenerife to be heated in the winter months. People come from all over Europe to enjoy a sun-drenched, relaxing holiday in Tenerife. Why not make it your next great holiday? The apartment is in a quiet complex but you are a short walk from everything you need; supermarket, beach, great choice of bars and restaurants to suit all budgets and tastes, shopping for gifts, clothes, shoes and if you are feeling active, golf, water sports, zoos and two water parks, Siam Park and Aqualand are short bus rides (free) away. 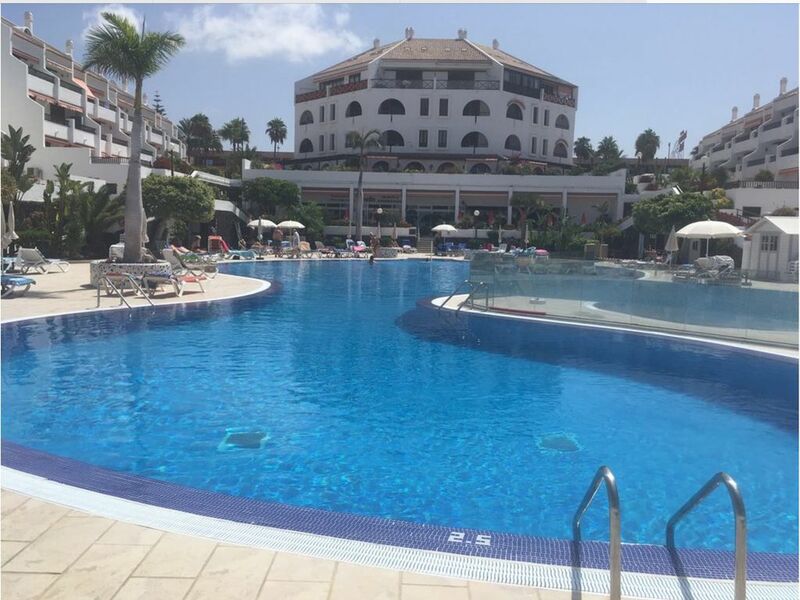 Playa de Las Americas has everything you need for a relaxing beach holiday. En-suite bathroom to bedroom 1 with bath, shower over bath, basin, bidet and toilet. You have to walk through bedroom 1 to reach the bathroom. Beds will be made up when you arrive for as many people as you tell us are coming. The complex has wi-fi by the pool which can be picked up on our balcony. The apartment's shady balcony is the perfect place to check your emails and catch up with friends back home. Bath towels and hand towels for each occupant. Two comfortable sofas and a TV showing UK channels (including Sky Sports, BBC1, BBC2, ITV, Channel 4). Desk with two shelves of light holiday reading. Dining table with four chairs. Plates, bowls, cups, glasses, cutlery, saucepans, frying pan. Small kitchen with hob, fridge, microwave, kettle, toaster, coffee maker, toasted sandwich maker, cupboards stocked with plates, bowls, cups, glasses, cutlery, saucepans, frying pan. Wooden table with four chairs. Or eat on the balcony overlooking the pool. Glass topped table with four chairs on the balcony. Sky Sports, BBC1, BB2, ITV, Channel 4, BBC News, UK Gold, kids channels and many other European channels. We have a good selection of light holiday reading on the bookshelves below the desk. Pool table in the bar downstairs by the swimming pool. Choice of golf courses nearby. Take a taxi from the rank on the corner and rent clubs when you get there. Recommended are Golf del Sur and the golf course at Adeje. For beginners, the short hole, par 3 course at Los Pallos is popular. And at Amarilla Golf, there is both an 18 hole course and a 9 hole, par 3 course for the less experienced player. Apartment overlooks the pool. You can use the pool for free but if you wish to sunbathe, you must pay €2.50 per day to rent a sunbed. Notes on accommodation: The apartment is spread over two floors with kitchen and open plan dining and living space downstairs with double doors to the balcony. Bathroom and bedrooms are upstairs. Sun beds can be hired at €2.50 per day by the pool. Centrally located but quiet apartment. Great apartment in a quiet location, but close to everything that you could want. Many bars, restaurants, shops and supermarkets close by. Well equipped and spacious. Minutes from the seafront and a short walk to nearby bus stops which give easy access to the airport and the rest of Tenerife. Highly recommended. Apartment was clean and well maintained on an excellent complex. Great location we would definitely go again. Speedy and accurate response from Paula the owner. Very enjoyable holiday. Comfy apartment. Fully equipped for our stay and in an ideal location. I would be happy to stay here again. The Parque Santiago complex backs right onto the beach. It's a 3 minute walk from the apartment to the sea. There are cafes on the ocean so you can stare at the waves with a coffee (or a fry up) or watch a spectacular sunset with cocktails (or a cup of tea). For a great sandy beach with sun loungers and umbrellas, walk along the sea front; 5 minutes to Playa del Camison or 10 minutes to Playa de las Vistas. Fly to Tenerife South Reina Sofia Airport. Then take a taxi to Parque Santiago, Playa de Las Americas. Taxi fare is around 25 Euro and the journey takes 20 minutes. Easyjet, Ryanair, Thomas Cook, Jet2, Norwegian and British Airways fly to Tenerife South. Book early for the best prices! A trip to the top of Mount Teide, the dormant volcano that dominates the island, is a popular day out. And boat trips to the island of Gomera, the smallest Canary Island, start at the port at Los Cristianos (20-30 mins walk or 5 mins in a taxi). You can take boat trips out to sea for dolphin and whale-watching; travel in a luxury yacht, a glass-bottom catamaran or a galleon. There is a well-stocked supermarket within the complex selling fresh bread and milk daily and there are other larger supermarkets (SuperDino or Mercadona for the best prices) five minutes walk away. Las Americas has a huge choice of restaurants, bars and cafes to suit every budget and there are still more along the coast in Los Cristianos. Despite the development of the last 30 years, Los Cristianos remains a charming, Canarian fishing port with restaurants, tapas bars and more traditional shops selling gifts and leather goods. For high-end luxury shopping, head to the Safari and Desert shopping centre where you'll find designer shops (Armani. Hugo Boss, Lacoste) mixing with more affordable Timberland and Levi's and the Spanish high-street giants Zara, Bershka and Mango. For the more active, there is a good choice of watersports; para-gliding, jet-ski hire, diving and snorkelling, surfing and windsurfing. For young children there are playground areas with slides and swings dotted along the seafront. Crazy golf at Parque Santiago 4 is popular with all ages. For a great family day out, try one of the local water parks. Choose from Siam Park, which has a gentle lazy river ride, 'beach' with wave pool and machine producing 2m high waves plus water slides of all varieties OR Aqualand, which also has water slides but offers a dolphin show every afternoon too. Free buses to Siam Park and Aqualand leave from Las Americas every half hour starting at 10am. If you miss the bus, a cab will take you for 6 Euro. There is a folder of local information in the apartment, with our recommendations for days out, restaurants and where to find the post office, bank, chemist etc. Booking Notes: I do not ask for a security deposit. Changeover Day: The apartment will be ready for you at 2pm (sometimes earlier) and we'd like you to have left by 10am. This can be later by arrangement. Please mention if you'd like to arrive early or leave late when you book. How Many Guests? Best suited for one couple or a family of two adults and one child or two adults and two children under the age of 12. Bookings from unaccompanied teens will be refused.